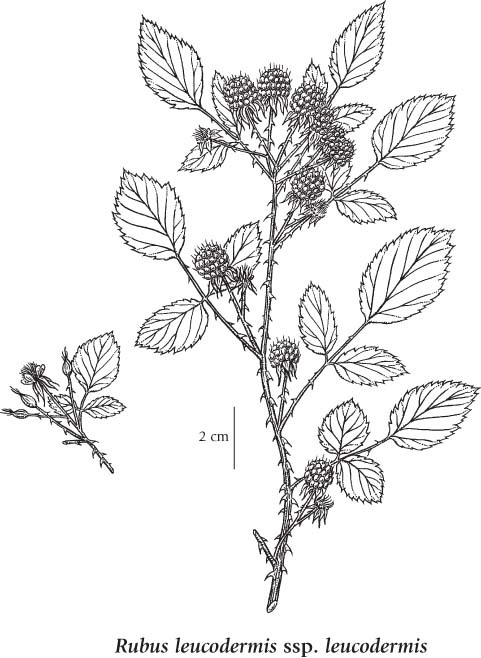 Medium shrub, 0.5-2 m tall; stems erect to ascending, some arching back to the ground and sometimes rooting at the tip, armed with short, stiff, somewhat flattened, recurved or sometimes straight prickles, very glaucous. Alternate, deciduous, pinnately compound; leaflets 3 (to 5), egg-shaped to broadly lanceolate, 2-8 cm long, double-saw-toothed and sometimes lobed, sharp-pointed at the tip, greenish and smooth above, white-woolly beneath, the veins and leaf-stalks prickly; stipules linear, 5 mm long. Inflorescence of 2 to 7 stalked flowers in small, open, umbel-like to flat-topped, terminal or sometimes axillary clusters, the stalks woolly and prickly; corollas white, the petals 5, erect, spoon-shaped, 3-5 mm long; calyces woolly and often glandular, 5-lobed, the lobes lanceolate, long-pointy-tipped, bent back, 6-12 mm long; ovaries superior; stamens 70-100. Drupelets, finely and thinly woolly, in a reddish-purple to black, globe-shaped cluster that falls intact from the dry receptacle (a raspberry), the berries 1-1.2 cm wide. Dry to moist thickets, rocky slopes, clearings and open forests of the lowland to montane zones; common in SW BC, infrequent in SC and SE BC; S to MT, WY, UT, NV and CA.